Every day I leave work and usually catch some portion of an amazing Arizona sunset and I've been struck with the coincidence the timing of this event. These sunsets have begun to mark the end of a large portion of my day and I wanted to do something with it. So I've begun a small photography project. Basically for the last week or so I've been taking a few photos of the sky and maybe some portion of the surrounding scenery as I leave the office each day. 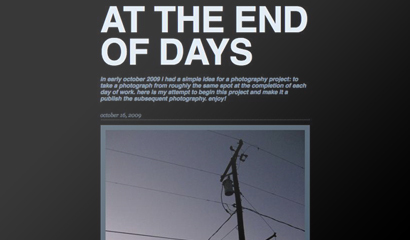 And I've begun posting these photographs to a small Tumblr blog called At the End of Days. Essentially I've placed two rules on this project: post one photo per work day and the shot must be taken at whatever time I leave the office - no weekends, no lunch shots, no sunrises. Just beautiful Arizona sunset skies. So if you want to keep up with this project of mine and catch a small glimpse of what I see every day, feel free to follow me at AtTheEndOfDays.Tumblr.com. I don't know how long this will last though the plan right now is to keep it going for a while. Feel free to let me know what you think and what you feel might make it better. Hope you enjoy!